In my previous post, I discussed the steps required to embed a Google Maps widget in an HTML5 help system. 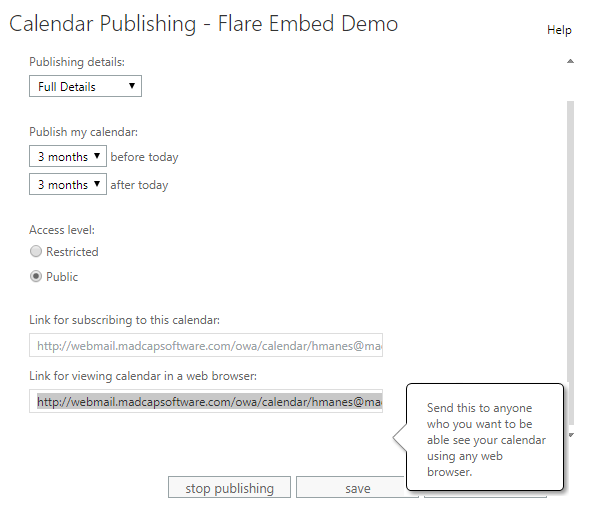 This post covers how to embed a Google Calendar and an “add to calendar” button in a MadCap Flare topic, and outlines the steps to make an Outlook calendar public and accessible via a URL. Many organizations manage public calendars to share any events or conferences they host or attend. Calendars offer users context and provide a familiar visualization of their potential time commitments. 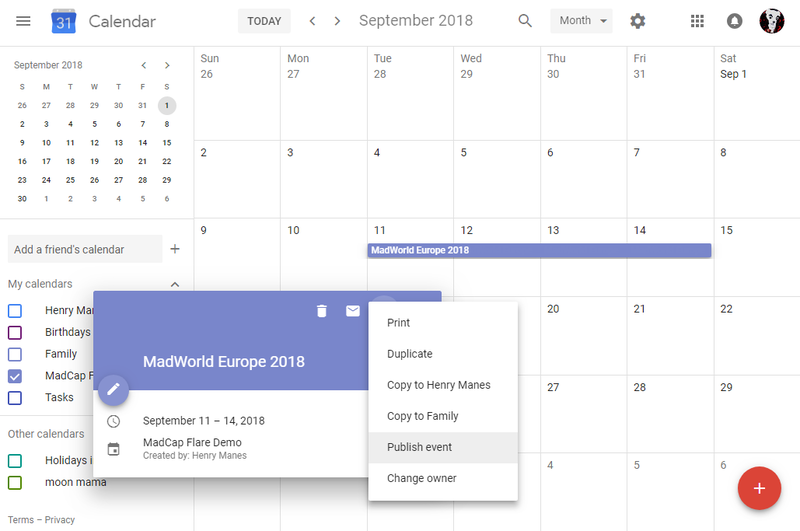 In the examples for this demo, I will share a calendar in which the only event is MadWorld Europe in September 2018. 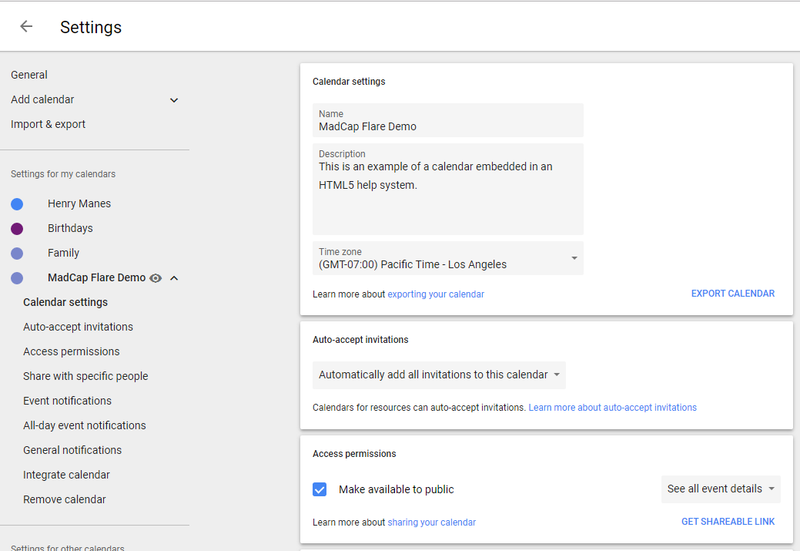 You will need to be able to access the calendar at https://calendar.google.com/, or have someone with access to the calendar follow some of the steps below and share the embed code with you. 2. Click on the gear icon in the top-right and select Settings. 1. Select Add Calendar > New Calendar on the left. 2. Add a name and description to finish creating the calendar. 1. 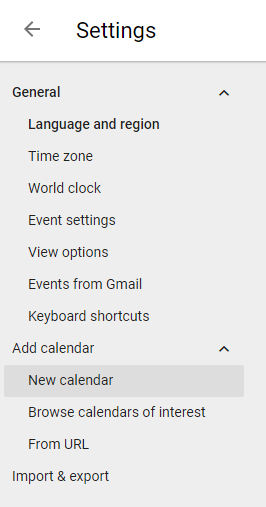 Select the calendar from the list on the left. 2. Enable Make available to public. 3. Select Integrate calendar on the left. 4. 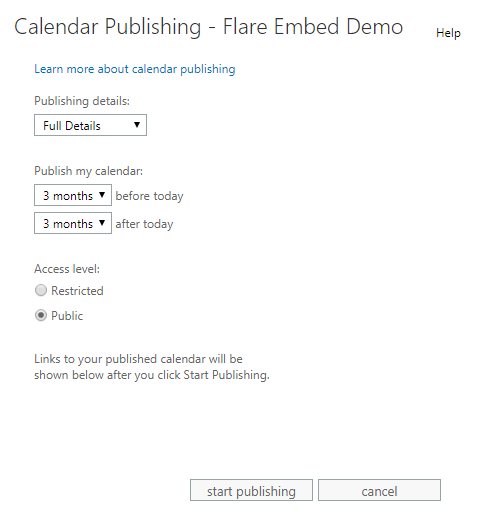 Copy from the “Embed code” field, or select Customize to choose more options for the display of the calendar and then copy the code from that page. With the embed code on hand, you can start flexing your technical authoring skills and adding this functionality to your MadCap Flare outputs. 1. 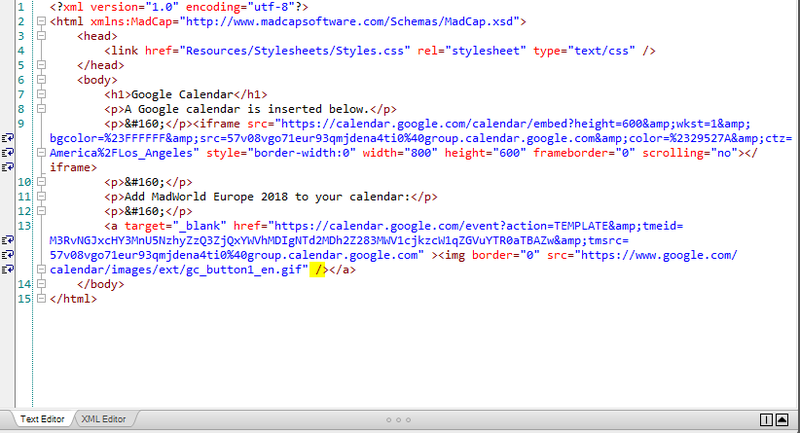 Open the topic where you would like to embed the Google Calendar in the text editor (right-click > Open with > Internal Text Editor). 2. 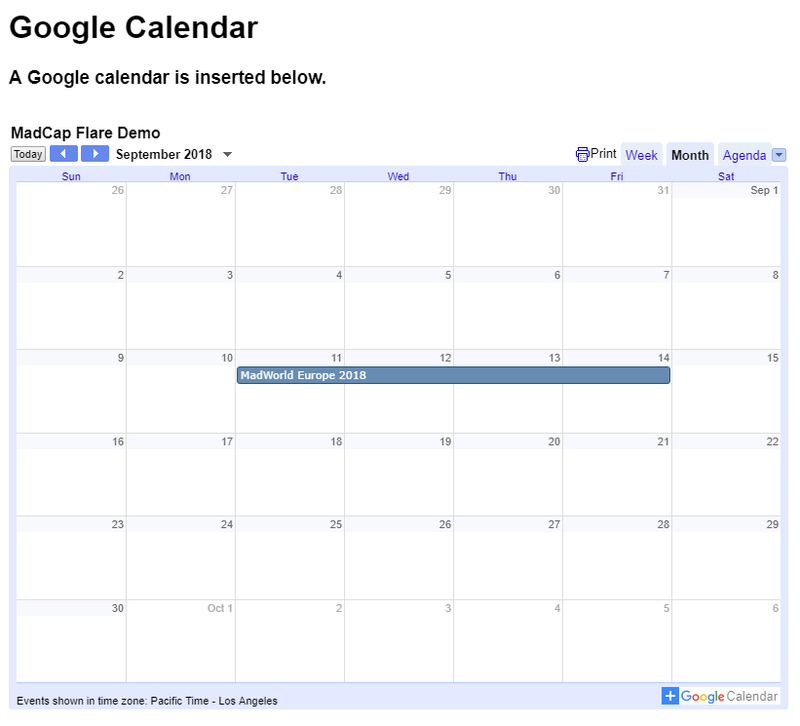 Place your cursor where you would like to insert the calendar and paste the iframe code from the field on the Google Calendar website. You can also insert a button than opens a new tab where users may log into their Google account and add an event to their own calendar. 2. Add an event to the public calendar, or select an existing event. 3. Select the three dots to open the Options menu > then Publish event. 4. In the “Publish event” window, copy the HTML code displayed. 5. In Flare, open the topic in the text editor and paste the code where you want the button displayed. 6. Add a forward slash to the end of the img tag to close it; otherwise Flare will return an error about invalid XML. The forward slash that must be added is highlighted in the screenshot below. However, it is possible to share an Outlook calendar publicly, and provide a URL that will allow anyone to view the calendar in a new tab. For this demonstration I have used Outlook 2010. 1. Open the calendar in Outlook. 3. 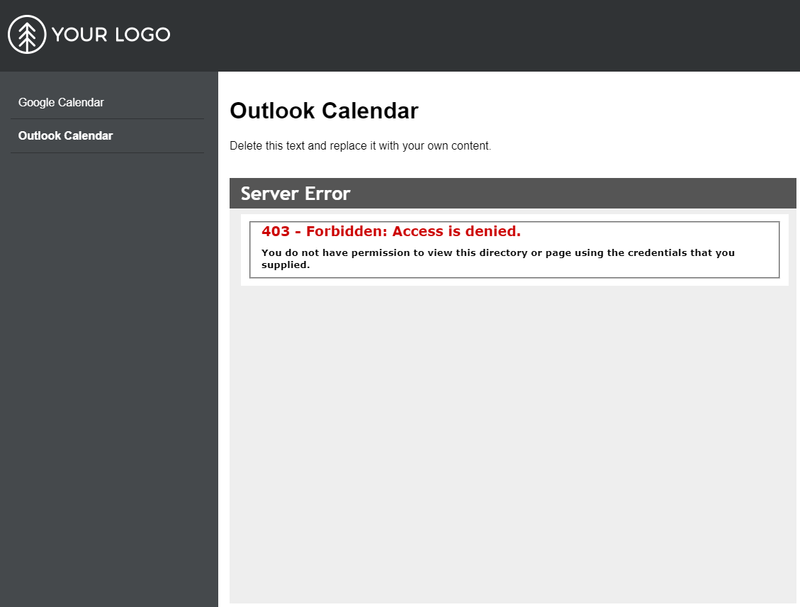 This will take you to the Outlook web app where you must login. Note: If your organization uses Exchange Server, you may be able to use your domain credentials. 4. Select the desired Publishing details and Access level and the click start publishing. 5. Copy the link from the “Link for viewing calendar in a web browser” field. 6. In Flare, open a topic in the XML Editor, then insert the link where you want it via the Insert a hyperlink button in the local toolbar, or the Insert ribbon > Hyperlink. Now that you have seen how easy it is to add calendars, you can test implementing it in many ways. Insert one in your organization’s help system, or perhaps create a personal calendar and host it on a site for family and friends. Got any examples or tips to share on how to embed a calendar in your outputs? Share in the comments below. Henry Manes is a Technical Support Engineer at MadCap Software. He first encountered XML while working as a business analyst for Covered California Health Exchange enrollments at Kaiser Permanente before joining MadCap Software, where he now helps customers make use of MadCap products to their full potential. He is a tech optimist and enjoys cycling, mixing dance records, and playing with consumer electronics. 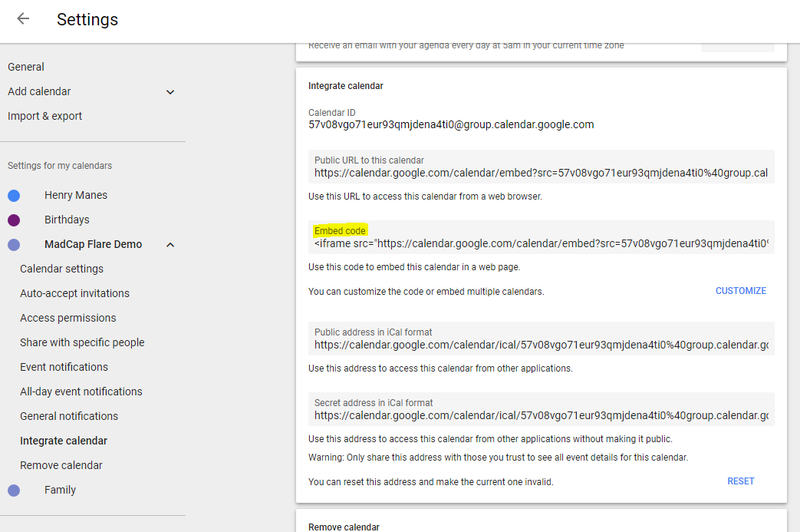 Might be a hack-ish solution, but I wonder if you could add an Outlook calendar to a Google calendar account by URL, then use Google’s embed feature to embed that calendar.